(NORWALK, Connecticut, April 12, 2018) — Innovative manufacturers from all over the world are counting down the days until the 2018 National Hardware Show® in Las Vegas. From Tuesday, May 8 through Thursday, May 10, more than 2,800 companies—including 500+ first-time exhibitors—will showcase their latest products for thousands of NHS attendees. Here, attendees and media will get an up-close and personal look at the tools, technology and trend-setting items to satisfy customers and boost sales. From A&B Home all the way to Zhejiang Hand Brand Hoist Co., Ltd., the 2018 National Hardware Show exhibitors come from every corner of the world. The 2,800+ brands include nationally recognized brand names and emerging companies. They bring cutting-edge products designed to give retailers the competitive edge and establish their operations as must-visit destinations for DIYers and pros alike. The National Hardware Show always has its pulse on the emerging products and categories hardware and home improvement customers will soon be asking for. That’s why this year’s Show features a full array of on-trend, high-tech products. Browse the show floor for smart home integration solutions, must-have outdoor furniture and accessories and a wide selection of eco-friendly and Made in the USA products. With NHS’s My Show online planning tool and NHS Mobile App, attendees can build their plans for the 2018 National Hardware Show and start connecting with exhibitors now! When registering for the event, attendees will be asked to identify the types of products and manufacturers they are hoping to see. Once registration is complete, they’ll get exclusive access to My Show, the free online planning tool, allowing attendees to browse the thousands of exhibitors, mark your favorites and even search for specific products. Using the National Hardware Show mobile app, you can access your My Show account and get directions straight to the perfect exhibitor booths based on your interests. Visit one of the specialized Match Me Booths on the show floor to get in-person recommendations to help you zero in on the perfect products for your operation. New Product Launch offers a convenient way to discover brand-new products that have yet to hit the market. These products have no pre-sales or exclusives and represent a variety of unique product categories. In New Product World, find the newest innovative products from all categories released in the past 12 months. Be sure to visit both areas to get a valuable glimpse today at the products your customers will be asking for tomorrow. With Inventors Spotlight, Show attendees can get an inside look at groundbreaking new products that could revolutionize the home improvement industry. Inventors have the opportunity to meet directly with key industry figures, manufacturers and investors to get feedback on their products. Sponsored by the United Inventors Association (UIA), this area is a must-visit to learn about the next generation of hardware and home improvement projects. Special Thank You to SUMEC Hardware & Tools Co., Ltd.
For years, SUMEC Hardware & Tools has aimed to provide creatively designed garden tools, high-pressure washers and power tools to customers across the world. This year, SUMEC Hardware & Tools is an official stage sponsor of the National Hardware Show. The National Hardware Show honors their investment in the independent hardware and home improvement industry and thanks them for their continued support. Don’t miss a moment of the action. Registration for the 2018 National Hardware Show is still open; register today at no cost here>>. 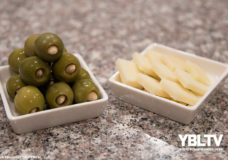 Olive It Review: Cocktail Hour and Hors d'Oeuvres Will Never Be the Same!